South Pacific models are also avail- able. The Humminbird GPS Naviga- tional System allows the built-in maps to be viewed from two differ- ent perspectives—either a bird's eye view with north at the top of the screen or a forward looking view with the present course at the top of the screen. Even if a boater travels beyond map coverage, complete navi- gational information will continue to be displayed as on a normal plot- ter. Atlantic Ocean Region East satel- lite to complete IDB-A's worldwide maritime communications network. Inmarsat to all shipboard earth sta- tions. IDB-A has also received approval to provide shore-to-ship service to the Indian Ocean Region through the facilities of Overseas Tele-Com- munications, Limited in Perth, Aus- tralia. Inmarsat dialing codes. IDB-A is also offering a variety of safety-re- lated services for Inmarsat Stan- dard A users. KFS World Communications, bet- ter known as Palo Alto Radio/KFS, in California, is now privately owned and managed since it was taken over from a major carrier in 1990. New and innovative services are being introduced at KFS which have the effect of making the tradition- ally equipped radio telegraphy (CW) and SITOR ships highly competi- tive with satellite-equipped ships in terms of speedy, reliable communi- cations at low cost. Normal message delivery time is less than four min- utes. Other improvements include hourly traffic lists and immediate calls (by arrangement) to ships when messages come in. Direct connec- tion between ships and shore telex machines is also available. VHF transceiver, the TKM-507. This feature, the MDR-1 "Digital Record- ing System" (DRS), allows messages of up to 32 seconds to be stored on either the receive or transmit mode. The DRS unit provides users the benefits of making immediate checks on calls received but not yet heard, and accommodates delayed trans- mission of outgoing calls. The TKM-507 deluxe transceiver is most popular in the commercial market, particularly the fishing in- dustry. Out here, business depends on knowing the lay of the land. Service is the shortest distance from out here to back there. And that means it can help you take care of business better. It's easy to check in from ship to shore. 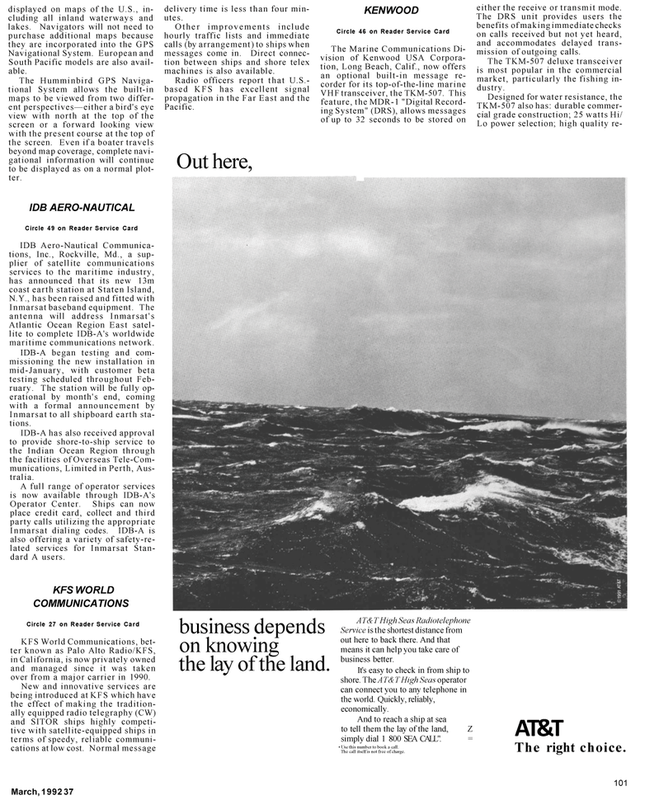 The AT&T High Seas operator can connect you to any telephone in the world. Quickly, reliably, economically. And to reach a ship at sea to tell them the lay of the land, Z simply dial 1 800 SEA CALL". = • Use this number to book a call. The call itself is not free of charge.